While many cinematic reboots encounter animosity/resistance, I believe no prior situation equals the battle over the 2016 Ghostbusters. Fans of the classic 1984 film went so ballistic that eventually the negative reaction to the 2016 version overshadowed the movie itself. Why this happened remains up to debate. Was it misogyny related to the 2016 flick’s largely-female cast? Was it protectiveness connected to love of the original? Was it something else? I don’t know, but the arguments flew hot and heavy. As one who adores the original, I guess I should’ve joined the fray, but I didn’t and I never quite understood the hubbub. A new Ghostbusters doesn’t eradicate the original from the earth – and it might encourage younger folks to check out the original. Oh, and there was always the possibility that the 2016 Ghostbusters - hereafter called GB2016 to save my typing fingers - might actually be good! Fueled by talent like director Paul Feig and actors Melissa McCarthy and Kristen Wiig, I thought the 2016 film deserved a shot. Physics professor Erin Gilbert (Kristen Wiig) hopes to achieve tenure at Columbia University, but the prestigious institution cans her when ghosts of her past re-emerge – literally. Along with pal/fellow scientist Abby Yates (Melissa McCarthy), she authored a book about the supernatural, and when Erin’s boss (Charles Dance) learns of this, she finds herself on the street. 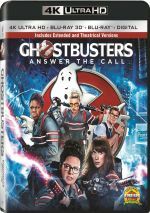 After an encounter with a real-life ghost, Erin decides to work with Abby and technical genius Jillian Holtzmann (Kate McKinnon) to deal with a burgeoning paranormal population in New York. This leads them to found their own business. In the meantime, transit employee Patty Tolan (Leslie Jones) contacts them about her own supernatural experience. When she tracks suspicious character Rowan North (Neil Casey) onto the tracks, Patty meets up with her own ghost – and she pitches herself as the fourth Ghostbuster due to her intimate knowledge of local history. The ladies deal with NYC’s apparitions and find themselves deeper and deeper into a plot that the creepy Rowan puts into motion. I went into GB2016 with high hopes but tempered expectations. I love the 1984 film and in no way expected the 2016 edition to be that good - though even if the 2016 flick was "objectively" as strong, it wouldn't seem so because it can't compete with the hazy lens of nostalgia. Happily, GB2016 works pretty well, though as a comedy, GB2016 isn't as strong as the original. While it comes with laughs, it's not nearly as funny. Face it: Bill Murray was at his peak in the original - the other actors got good bits too, but without Murray, GB1984 wouldn't have been half as strong, and no one in GB2016 comes close to his level. All the 2016 actors do fine but none of them runs away with the show ala Murray. Of the various performances, I'm surprised to say I think Leslie Jones becomes funniest. Am I tired of the stereotypical persona they gave her? Sure - the movie does try to "de-sassify" the character by the end, but it still gives her an awful lot of cliché material. That said, Jones allows it to work. In my book, she gets most of the movie's funniest lines and she made me laugh more than any of the others. Not that the others flop, of course. All in all, the cast does fine overall. None of the others stand out to me, but they perform well enough. Without formal spoilers, I’ll note that GB2016 comes with many cameos, and I do admit I have mixed feelings about all these. On one hand, it's fun to see so much of the old cast again, but on the other, their appearances can be a distraction. They also make it harder for GB2016 to stand on its own. Despite those flaws, GB2016 enjoys a unexpected strength: its action scenes. I view GB1984 as a comedy with horror/action moments, while GB2016 is an action/light horror movie with comedic bits. And the action/horror stuff works surprisingly well. The narrative melds the "origin story" of the Ghostbusters team with the overriding theme of Rowan's scheme well and comes to life nicely during the "ghostbusting" scenes. In particular, the climax proves to be pretty exciting. It ups the ante with a slew of ghosts and sends the heroes after them in a satisfying manner. Does GB2016 end up as a great film? Nope, and it won't make anyone forget GB1984. However, it's a definite step up from Ghostbusters II and a fun film in its own right. All the kvetching and naysaying ended up for naught, methinks. Whatever ups and downs come from GB2016, I enjoyed it and it left me eager for a sequel. Footnote: stick around through the end credits – all the way to the very last moment! 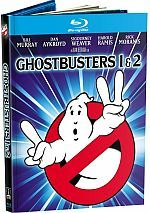 Ghostbusters appears in an aspect ratio of approximately 2.39:1 on this Blu-ray Disc. From start to finish, the movie looked terrific. Sharpness excelled. If any signs of softness occurred, I didn’t see it, as I thought the film consistently displayed tight, precise visuals. No signs of moiré effects or jagged edges appeared, and I witnessed no print flaws. To the surprise of no one, the film emphasized the usual orange and teal palette. The various supernatural elements allowed for other hues at times, but orange and teal dominated – and they looked fine within the stylistic constraints. Blacks were deep and firm, while shadows offered smooth, clear visuals. I felt wholly impressed by this stellar presentation. One unusual aspect of the image: a replication of the film’s IMAX version, this Blu-ray let some components literally escape the frame. Ghosts, slime and proton rays would sometimes burst out of the 2.39:1 box and fill the “dead space” on my TV. A short portion of the climax also opened up the frame to fill my 1.78:1 set ala the IMAX shots for movies like Interstellar and Star Trek: Into Darkness. This became a fun addition to the movie. The manner in which the visuals go beyond the standard frame made them more exciting and fun – especially during the film’s 3D version, but more about that later. Just as good as the picture, the movie’s DTS-HD MA 5.1 soundtrack added a lot of pizzazz to the package. With so much supernatural havoc, the soundscape enjoyed a slew of chances to come to life, and it did so well. Ghosts and related elements filled the room and zoomed around the spectrum in a vivid, well-integrated manner. Everything connected together in a fluid manner that formed an engrossing circumstance. Audio quality also succeeded. Music was bold and full, while speech seemed concise and well-rendered. Effects appeared accurate and dynamic, with terrific low-end. I loved this exciting soundtrack. The set includes two versions of the film. In addition to the theatrical edition (1:56:34), we also find an extended cut (2:13:44). How do the two differ? The changes mostly revolve around short additions to existing scenes, as many of these add little jokes. A few more substantial alterations take place, though, with the biggest connected to Erin’s co-worker/boyfriend Phil. In the theatrical cut, we see no signs of Phil at all, but he plays a moderate role in the extended version. One other scene shows Rowan at work – and the burgeoning impact of the ghosts – while another lets us see Abby and Erin as they relive their shared past. The only other minor excised plotline includes a skeptic who harasses Erin – and the aftermath when she punches him. As a fan of the film, I’m happy to see these scenes, but I’d be hard-pressed to cite any that truly add to the movie. On their own, they’re fun, but I don’t think they improve the film. The “Extended Cut” scenes give us an enjoyable alternate version but not one that acts as anything other than a minor curiosity. While I liked my time with the longer version, I’d probably prefer to watch the theatrical edition in the future. 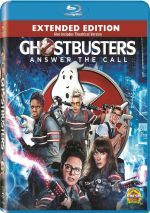 The package provides two audio commentaries, and the first involves writer/director Paul Feig and writer Katie Dippold. They sit together for a running, screen-specific discussion of story/character areas, visual and practical effects, cast and performances, editing and changes for the Extended Cut, sets and locations, music, stunts and actions, and related domains. Expect a nice production overview here. As expected, Feig and Dippold emphasize story/character issues, but they also touch on a good variety of additional topics, and they do so with charm and ebullience. This ends up as an informative and enjoyable chat. For the second commentary, we hear from Feig, editor Brent White, producer Jessie Henderson, production designer Jeff Sage, visual effects supervisor Pete Travers and special effects supervisor Mark Hawker. All sit together for another running, screen-specific look at various effects, sets, locations and production design, editing, cinematography and similar technical topics. Though not as peppy as the Feig/Dippold chat, this track still offers a good overview of the movie’s nuts and bolts. Yeah, it drags a little at times – Feig even starts to sound desperate for content about halfway through the film – but the commentary gives us more than enough useful material to merit a listen. Two Gag Reels run a total of 15 minutes, 29 seconds. These mostly offer the usual goofs and giggles, but some alternate lines appear as well. Those give it extra value. Four Deleted Scenes fill a total of nine minutes, 22 seconds. We see “Past Lives” (1:56), “The Big Test” (0:42), “The Breakup” (6:20) and “Where Are You?” (0:24). As those running times imply, “Breakup” offers the most significant of the four clips. It depicts a rift in the Ghostbusters team, as Abby and Erin bicker. It offers an interesting detour – and a short cameo from Michael Hitchcock – but I think it would’ve slowed down the film if included. The other three bits give us entertaining material as well. “Past Lives” delivers more background about the Abby/Eric relationship, while the other two throw in minor expository beats. All seem enjoyable but inconsequential. 11 Extended/Alternate Scenes take up a total of 21 minutes, 14 seconds. Some of these address sequences from the movie’s Extended Cut – like our intro to Erin’s boyfriend – but most stem from material in the theatrical version. As with the deleted scenes, the extended/alternate pieces offer more amusement but nothing I’d call significant. Still, laughs result, and that’s about all I can ask. With Jokes a Plenty, we locate a 34-minute, 30-second collection with six different reels. These offer alternate lines from various points in the movie. A great deal of entertainment results. During the eight-minute, four-second Meet the Team, we hear from Feig and actors Melissa McCarthy, Kristen Wiig, Leslie Jones, and Kate McKinnon. “Team” looks at characters, cast and performances. I like some of the behind the scenes footage but the interviews don’t add a lot. Next comes The Ghosts of Ghostbusters. It goes for 13 minutes, 57 seconds and includes Feig, Travers, Dippold, McCarthy, Jones, costume designer Jeffrey Kurland, actor Steve Bannos and stunt mannequin Jen Harris. As implied by the title, this piece tells us about the design and execution of some of the movie’s ghosts. It proves to be pretty informative and works much better than “Team”. In the 15-minute, 16-second Visual Effects: 30 Years Later, we find info from Feig, Travers, Wiig, Sage, Dippold, producer Ivan Reitman, gaffer John Vecchio, prop master Kirk Corwin, and drone operator Tim Walkey. Like the title states, this one looks at various forms of effects used for the film. It echoes “Ghosts” to become another educational featurette. Slime Time lasts five minutes, 15 seconds and features Wiig, Jones, Hawker, and special effects technician Robert Caban. Here we learn how about the movie’s green goo. It’s not the most substantial piece but it comes with some good thoughts. For the final featurette, Chris Hemsworth Is ‘Kevin’ occupies seven minutes, 42 seconds and brings us Jones, McKinnon, Wiig, Feig, McCarthy, stunt coordinator Walter Garcia, and actor Chris Hemsworth. This tells us about Hemsworth’s work on the film. The interview comments tend to be fluffy but I like the smattering of improv moments. The disc also provides a Photo Gallery. It presents 85 images that let us see various forms of concept art. It becomes a surprisingly solid collection. The disc opens with ads for The Shallows, The Magnificent Seven, Kingsglaive: Final Fantasy XV, Billy Lynn’s Long Halftime Walk and Inferno. No trailer for Ghostbusters appears here. Ignore all the negative hype about 2016’s Ghostbusters reboot and you’ll find an enjoyable film. A nice mix of action, comedy and horror, the movie may not match with its predecessor but it succeeds in its own right. The Blu-ray provides excellent picture and audio along with a nice allotment of bonus materials. Give Ghostbusters 2016 a shot and I suspect you’ll like it.